Lew’s Mach 1 Speed Stick Series 6’10” Medium Heavy Casting Rod Model MH1SH610MH (Retail Value $79.99) and a Strike King bait assortment (Retail Value $20.00 ) the first 250 two day entrants. If you have previously registered/paid online then you have an official entry into the tournament and are NOT required to attend the registration on Friday. 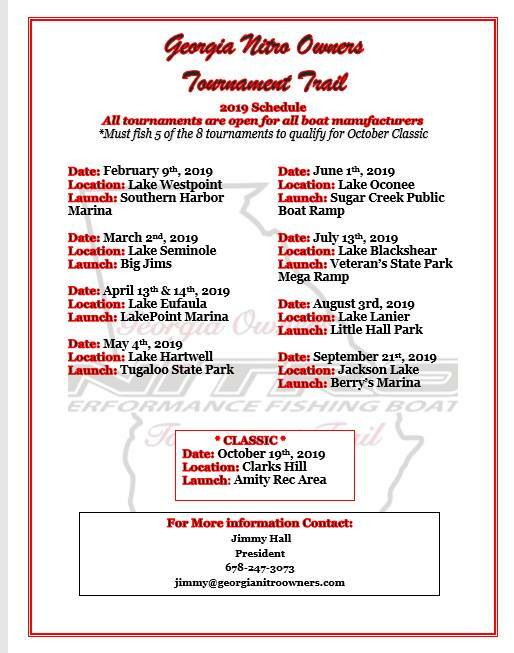 Friday’s registration is ONLY for anglers who have not already entered/paid for the tournament. *If you qualified to receive an early online entry rod (see below). You may enter yourself in the text system for this event by texting the word georgia to the number 25827. We will enter your number in the system but some carriers block these type of messages, so by entering yourself this will prevent the chance of being blocked. Also if you have previously opted out of our system, you will have to put yourself back in the system by texting the above keyword. If you opt out we cannot put you back in the system. Early entry promo rods may be picked up at registration sites above or after 3pm each day of the tournament. Please do not call our offices related to early entry rods. There is a rod counter at the top of each event page. Rods are gone when counter shows zero. We will post the date the counter goes to zero on the site. *Your co-angler may pick up your rod for you if you’re unable to be present.